UPDATE: Interesting note about using Google Voice with Skype incoming number. I finally decided to disconnect my POTS telephone line in our home since everyone now has cell phones and because we no longer have children in the house below high school age. However often times folks at home forget to leave their cell phone on, it's in another room and you can't hear it ringing or sometimes there is confusion for family members to know what number to call to reach us at home. Since I already have a Skype subscription I decided to make use of the wired phones we had in the house already and make a whole house Skype ringer. High speed internet. In fact I really recommend a broadband internet connection. However a satellite connection would also likely work but may be choppy. Dial-up modem connections in theory would work however it will likely not be practical for every day use. It is assumed that since telephone service is bundled with DSL Lines that you are likely not attempting this procedure with DSL albeit in theory it could work as long as you separate the Skype phones lines from the DSL modem. There is also "Naked DSL" and either mode of DSL would be sufficient bandwidth to handle Skype. One final option mostly used by folks in rural areas or recreational vehicle campers is to use a cellular modem or so called air card internet connection as your source of internet. I have some notes on this on my Mobile broadband and internet page. And of course WiFi if you have access to it would also work. A Skype account from http://www.skype.com. Note that you do not necessarily require a Skype subscription (used to be called Skype out) if all you plan to use is Skype to Skype calling (pc to pc). A computer (that supports Skype and a Skype adapter) running as long as you require the phones to ring. I use a Linux server that runs 24 hours a day. A Skype adapter. These are usually USB connector. I use a Yealink USB-B2K. And finally you will need self-powered phones to connect to your house's phone wiring. Note that old style phones that take power from the phone line such as the old style Bell phones (in other words wired handset phones) will not work in this case. This is because normally the phone company supplies the voltages needed. This usually means you can only use cordless phones you plug into the wall with a power wart. If you choose Windows operating system (which is usually the only supported operating system using supplied software with the adapter) it's a simple matter of installing the supplied SkypeMate software (note the disc that comes with the B2K is very old be sure to get the latest version [4.0.2.2 as of 2009-09-09] from http://www.yealink.com/en/download.asp?BigClassName=USB%20VoIP%20Phone or search for SkypeMate on the Yealink site) and possibly drivers, plug in your Skype adapter to a USB port on your computer and a telephone to the telephone port of the adapter and your basically ready to go. If you go this route jump down to Network interface below for the whole house ringing part of this procedure. If you are using Linux like me however there is more work to do. read on. I use the Gentoo GNU/Linux distribution however in theory any distribution should work. In my case I will be specific to the Yealink USB-B2K. If you are using something else make sure that there is a Linux driver for that device and how well it is supported before attempting to use Linuc for your host computer. usbb2k_api. A small driver daemon that converts simple human-friendly commands to the binary whatsit language used by the telbox, and likewise returns responses sent back by the box in human-friendly (or at least, programmer-friendly) form. kb2kskype. 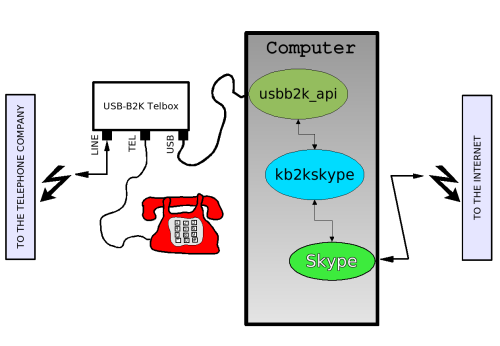 A bridge application that, using the simplified command set groked by usbb2k_api on one side, and the Skype Public API on the other, causes incoming Skype calls to ring the phone, and keypresses on the telephone to be fed through to Skype. Skype. You should install version 1.4 (or later) of Skype (version 1.3 will work, but 1.4 is superior software). In my case with Gentoo I emerged stable version 2.0.0.72. 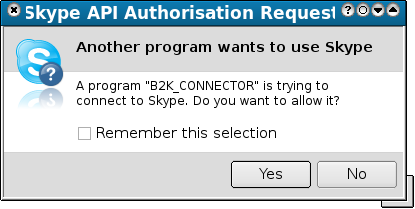 Refer to the install instructions at http://kb2kskype.sourceforge.net/downloads/install_skype_bk2k_en.pdf (mirror below). This will stay running in the background and create a socket at /tmp/usbb2k.sock. If you see "USB NOT FOUND" it means the API could not find your B2K device, either USB support is not in the kernel or the port may be bad. Test the device in Windows first to make sure it works ok.
Hit Control-C to exit the api_connect program. * A recent 2.6 kernel with snd-usb-audio compiled in. Note that you need to have X Windows running and possibly a windows manager as well. In my case I use KDE. Make sure to allow the connection to Skype and check "Remember this selection". Make sure to select USB mode for whole house Skype we won't be using PSTN at all. First I had to disconnect the street telephone lines from the rest of the house. 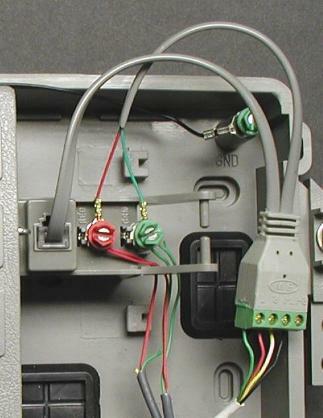 WARNING this will remove your ability to dial 911 or 611 (repair) from your wired phones. I recommend you write down the emergency and non-emergency direct numbers of your local fire, police and ambulance services some where central where everyone in the house can see them in case you have need of their services. Calling 911 from Skype is not really supported and there is no telling which dispatch center you are likely to end up on. Simply disconnect the RJ-11 telephone jack which will disconnect you from the "street" or phone company. This will not cause harm to the phone company or to your equipment. 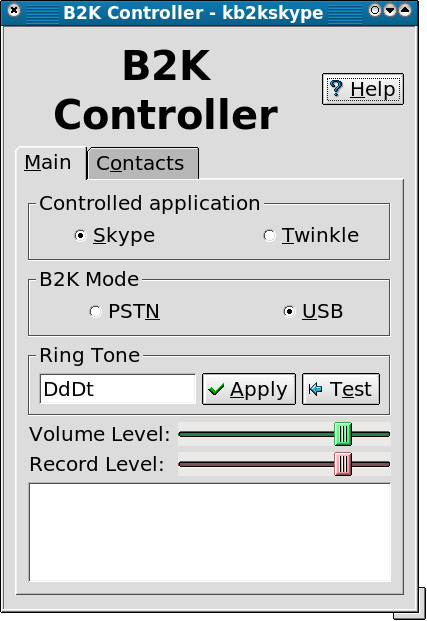 Now the next step is to connect the Skype adapter to a phone jack in your house using the telephone interface and NOT the line interface. The difference being that the line side of the adapter is meant for POTS line (telephone company) service. Since they are all wired in essentially in parallel to the outside NID this will cause all phones to ring when ever the Skype adapter sends a ring signal down the line to all the phones in the house. "I use SIPgate's free phone number as an endpoint phone for Google Voice; I can have incoming AND outgoing calls completely free, ignoring the cost of the Internet connection at home."